Make a easy peasy Caprese Salad with the end of season harvest from your herb garden. I will also be sharing, her 3 sister salads made with some other treasures from our garden. All this week we have been discussing what to do with your end of season harvest of veggies and herbs, be sure to catch next weeks Herbivores’ Harvest post where we process the remaining mother load of herbs for the season. While this particular recipe is not ground breaking, I do find that the simplicity of a fresh caprese salad is always perfect with any meal. The fact that it is simple and easy to make just makes this recipe one that anyone can do. The first and most important part of this recipe is the freshness factor. Which is what makes it the perfect picked from the garden salad. All you need is tomatoes, fresh basil, mozzarella cheese and a really good olive oil. In this recipe I only use Oliv+Ve, Tuscan Herb Olive Oil from my good friends at Oli+ve in Roswell. For our family nothing else will do. Their fresh certified ultra premium, extra virgin olive oil from artisan batches with 100% natural, organic flavors, are simply the best. I also really like to use a mix of fresh tomatoes, this year I grew my own variety consisting of Heirloom San Manzano Roma’s, Sungold Cherry’s, Black Cherry Heirloom Tomatos, and Grape Tomatoes. They made a really pretty mix, especially for a caprese salad. Fresh Basil is also key in this recipe and makes a ton of flavor and color difference in this recipe. My tip is to add it at the very end just before serving so it stays nice and fresh and does not get soggy. I also like to roll my leaves and slice them into uniform strips to make a pretty green confetti look for the salad as seen below. While this salad can be eaten alone, or as a side salad, I also like to use this to top grilled chicken or fish. It makes a perfect appetizer, with some crusty french bread and balsamic glaze for a bruschetta. I even have used it to top off scrambled eggs for an Italian Breakfast brunch, and it can also be used on a flat bread and baked for a quick pizza option. Such a versatile and tasty summertime option. Okay, so now for her 3 Little Sister Salads, the first one is what I call Texas Caviar. It is basically another cold salad that can be used as a dip, with tortilla chips or it is great on grilled chicken or steak fajitas. 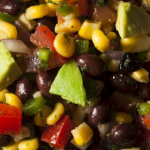 You can also make a really nice Tex Mex Salad or Nachos with the same mix. Again very versatile and perfect use of summer time foods from the garden. Diced up Tomatoes, Onions and Jalapeños into a glass bowl. Open Beans and Corn rinse, and add to bowl. Squeeze juice of one lime into bowl, stir all ingredient together. Chop avalados into cubes and add to bowl with cilantro. Lightly toss just prior to serving. The next two recipes are types of pestos, the first one is a basic Italian pesto the perfect way to use up more basil, and it pairs great with the tomatoes again. The second pesto is a Thai Basil Pesto for a more exotic flavor and is wonderful on stir fry dinners containing shrimp, chicken, pork or steak. Add all ingredients into a food processor or blender and mix until smooth. The perfect easy salad for low calorie dinner or vegetarian option. Sometimes it is nice to add something light in during the months of rich heavy foods. We love a Caprese salad with our fresh tomatoes and basil, but I love the 3 other recipes you have here too! The Thai Basil Pesto is very unique I have always wondered what to do with Thai Basil when I see it for sale and now I know. Thanks my friend! Yum I love that you also included 3 other herb based salads in this post too. I love the Thai Pesto what a interesting concept, you may consider making them a separate pin. Great job. Really great post! I will try this! This looks so good! The perfect salad for tonight! Love it! Oh I love a good fresh from the garden salad and these are all great! I am looking forward to the rest of your herbivore posts! They really peaked my interest. Totally going to try this out! I love delicious salad and it looks so yummmm. Gonna try this soon. Cassie it is really good and very unique recipe I came up with on my own, it is perfect on chicken or shrimp for a stir fry. 🙂 My husband love Thai Basil Fried Rice, so I came up with a version I could make at home for him since we do not have any Thai restaurants in our local area. Yum! I have so many veggies from my garden and not enough recipes to use them for. I’m so going to try that Caprese salad. It sounds delicious! Thank You Vaishali coming from you that is huge honor! You are the queen of recipes! I love the idea of three little sister salads..:). Great recipes Jennifer! I search for some healthy and tasty recipes nowadays. Just want to keep myself healthy with taste and these salads contain all the healthy things. I’ll try texas caviar. Yum! This sounds so tasty and it would be a perfect way to use up some of my moms bumper crop of tomatoes! This is such a yummy recipe and love this specialty flavor of olive oil you are using, I need to check them out online.